White poly frock protects clothing during meat processing or cooking. Two large pockets in front plus inside chest pocket. White poly apron protects clothing during meat processing or cooking. One chest pocket for pen or thermometer. Protect your clothes during meat processing or cooking plus much more with this yellow vinyl apron. 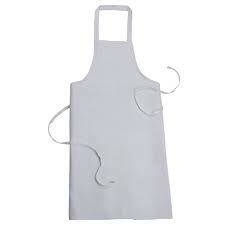 Protect your clothes while BBQing, meat processing or just cooking in the kitchen with this white bib cotton apron. 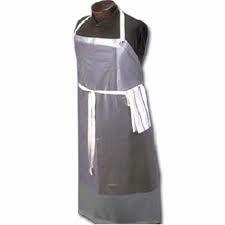 Heavy duty rubber apron to protect your clothes during meat processing. 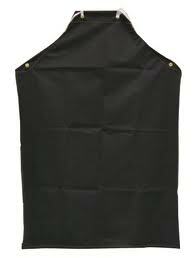 Protect your clothes while cooking with this vinyl bib apron. 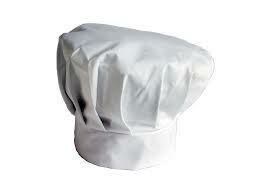 Protect your hair while cooking, BBQ'ing or meat processing with this white chef hat.